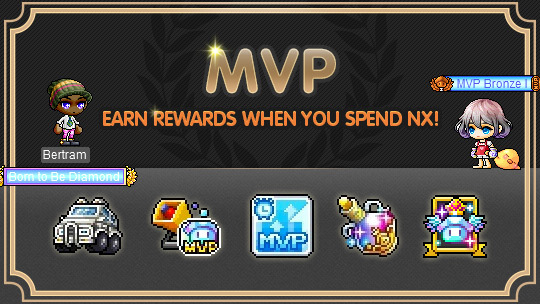 MapleStory introduce the Maple Value Points (MVP) Service to players now! Spending enough NX to get your MVP title. Players' account ID will be categorized by spending habits and given a tiered ranking in each of two different MVP systems, MVP Bronze and MVP Special. MVP Bronze ranks are based on the cumulative amount of NX spent in your account’s lifetime (starting from March 1), and once you achieve a tier within that rank, you cannot go down. MVP Special ranks are based on the amount of NX spent within the past 3 months (starting from March 1) and can go up or down. Each player's status can be found in each ranking system by clicking on the MVP Service UI located within the Cash Shop. You can see your current ranking and how close you are to the next ranking. Each time you achieve a tiered ranking, you’ll receive special benefits. You will also receive a daily gift package (one per account per day). Your daily package is based on the ranking you achieved at midnight UTC (4:00 PM PST the previous day). When you achieve a tiered ranking, you’ll start receiving the benefits immediately. These benefits will be valid until the end of the month. You will also receive a daily gift package (one per account per day). Your daily package is based on the ranking you achieved at midnight UTC (4:00 PM PST the previous day). Any gift items you receive will expire at the end of the month in which they were received (unless otherwise specified). If your spending habits change and you lower in rank, this won’t take effect until the 1st of the following month. MVP Special members receive a discount when enhancing items using Star Force. Discounts are given to enhancements for 1 -17 stars. Superior-ranked items are excluded from the discount. All MVP members receive a daily gift package containing one to four random items depending on your MVP level. The gifts can be claimed on one character per account. To receive the gifts, click the ‘Daily Pack’ button on the MVP Service UI within the Cash Shop. All MVP members receive a monthly gift package to one character per account. To receive the gifts, click the 'Monthly Pack' button on the MVP Service UI within the Cash Shop.